Windows Vista might look prettier, but that extra eye-candy comes with a lot of extra headaches for users who don't want constant reminders of updates or need excessive security features that lower productivity. 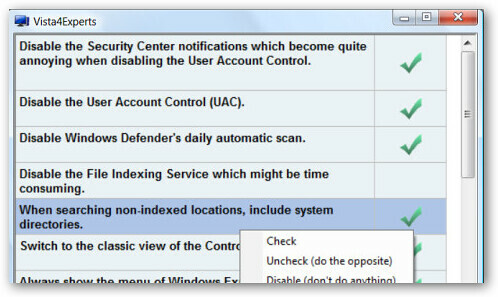 Vista4Experts helps alleviate some of this pain by letting you quickly disable or alter the behavior of Vista without having to look through endless menus and saving you hundreds of clicks. In one place, you can disable the User Account Control (UAC), disable processor-intensive file indexing, set Google as your default home page, prevent security center notifications, and implement many more feature changes. It's a great time saver for those who want to get rid of the most annoying aspects of Vista.